Above: My father, Efstratios (right) during the Greek- Turkish War, 1919- 1922. Above Right: With friends: From left, we are: unknown, Dimitrios talianis, Efstratios Savellis, Panagiotis Axiomakaros, and myself. 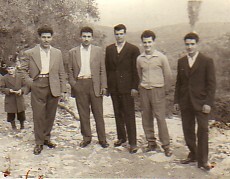 This photograph was taken at Kaboudi, Agiassos. Above: In the Gardens of Tis Panagias. My mother, Mersina, is sixth from the left, while I am fourth from the left. To my left is my nephew, Efstratios Axiomakaros and to my right is Grogorios savellis. To the right of my mother is my sister, Efthalia, and my niece, Katina Chrisafis is third from the right. Standing in the middle is my niece, Europi. Above: My engagement to Angeliki Aliferi. Above Right: At Vrahos Nightclub with Diamandis Margaritis (left) and Theo Margaritis (right).